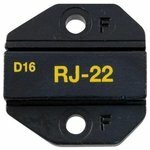 Molex 8P8C/RJ45 Plug & Cable O/D around Ø5.8. 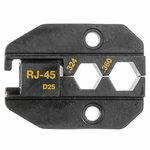 Replacement crimper die (Molex 8P8C/RJ45 Plug & Cable O/D around Ø5.2). 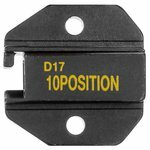 Replacement die for crimping 8P8C/RJ45 connectors. 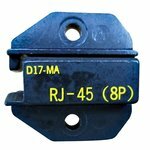 Replacement die for crimping 8P/RJ45 WE/SS Modular Plugs & RG6/RG6 Quad Shield CATV "F" connectors. 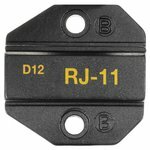 Replacement die for crimping 6P2C/RJ11-RJ12 connectors. 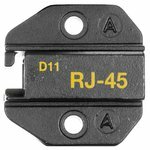 Replacement die for crimping shielded 8P8C/RJ48 Hirose-type connectors. 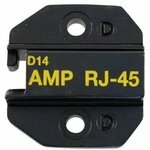 Replacement die for crimping 10P10C/RJ50 connectors. 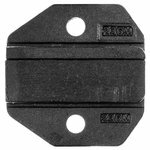 Replacement die for crimping 4P4C/RJ22 connectors. 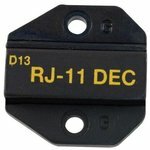 Replacement die for crimping DEC MMJ 6P2C/RJ11 connectors.